Posted on 9th January 2018 by Claire Austin Posted in Voodoo Dolls	. If you’re looking for somewhere to social dance this weekend, look no further! 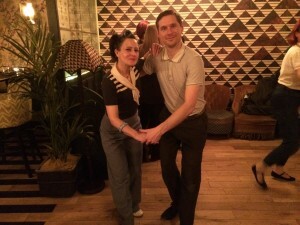 Jinx Joint in north London has great music, a lovely large dance floor, parking, cheap bar and is close to Bounds Green Tube (Piccadilly Line – night tube). Resident DJ Mr Jinx will be joined this month by Jumpin Jim plus Voodoo Doll will be joining them for a special guest slot on the decks. Posted on 8th January 2018 by Claire Austin Posted in Voodoo Dolls	. We are back after the Christmas break with some super smooth Hollywood Style Lindy Hop tonight in north London. All levels welcome. No need to bring a partner. Just turn up!!! Practise time and social dancing after the classes have finished. Humdinger – new vintage weekender for the Heppest Cats & Kittens!